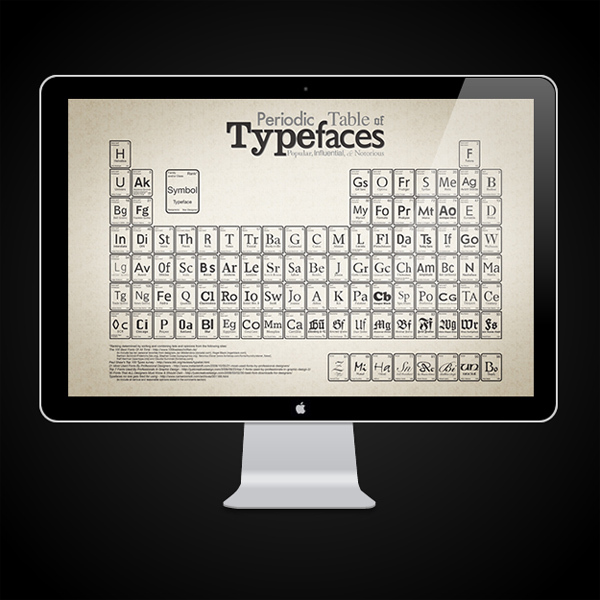 Get a Periodic Table of Typefaces for yourself! Options, options, options... We've got nice prints for sale down below as well as other options you may be interested it. Please scroll on down to see all the awesome options you've got. Plus, have a look at the cool stuff other people are doing with the design! Finally, there have been many questions and comments about the creation of the design and about the design itself so we've tried to throw together a FAQ to answer some of them. Thanks for the interest and again, have a look at what we've got for you! Questions and comments can be e-mailed to cam.wilde@gmail.com. Here's the one most folks have been asking for! The whole original reason for the design was for it to be a cool print! Nothing more than some sweet reference/eye-candy for your wall. We originally produced the print ourselves but due to demand, we've handed the reins over to Scribble on Everything. Version 1 has sold out, but now Scribble has 3 versions to choose from (I call them versions 1.5, 2 and 2.5)! Version 1.5 is almost identical to the original run. It's 25.5 x 17" on 80lb camel hair cover stock. The printing is in a dark brown. Version 2 is on black paper with silver ink and the other is white paper with silver ink. 2 and 2.5 are both 24 x 18" on hefty 80lb cover stock paper. Very cool looking. Get one (or all three) of these newest prints HERE (tan version), HERE (black version) and HERE (white version)! Again, get the newest prints at Scribble on Everything now! If you have any questions about it, please shoot me an e-mail and I'll be happy to help you out. A bit about our previous version: we managed to get it printed on some high-quality 80 pound cover stock at a width of 25.5" by 17" high. The stock is called Camel Hair and has a nice texture to it. It was a great first run! 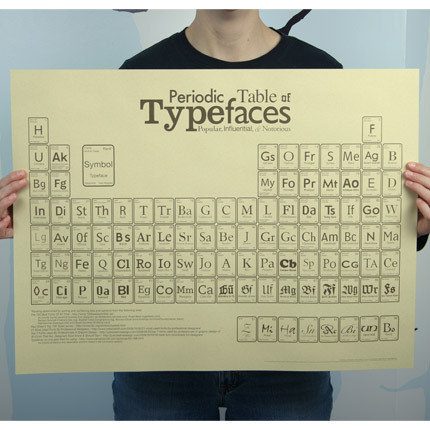 The folks over at FontLab, the creators of FontLab Studio, commissioned a color version of the Periodic Table of Typefaces for them to give out to educational institution, at type conferences, etc. You may be lucky enough to score one at a conference or if you visit their studios perhaps, OR you can save the hassle and purchase one right at their site if a color version is your thing! 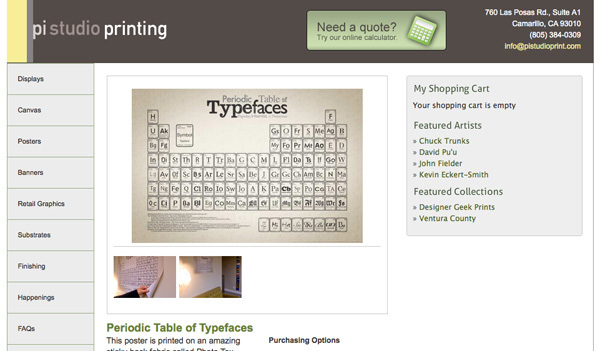 Have a look and head over to FontLab to buy! The second-most popular request has been for source files so you can create a high-quality print for yourself! This is a sweet deal because if you want the source files (vector eps, pdf or color pdf) then you pay what you want for it. Enter in any amount that you feel the source files are worth to you and I'll e-mail you the link to them right away (give me 24 hours max to get the link out to you). Be sure and specify your e-mail address and check it twice so you're sure to receive the link with no hitches. Use the PayPal below "Donate" link to set your own price (anywhere between one and a trillion dollars!) for the source files. Again, be sure to enter and re-check your e-mail address so I can send you the link to the files. Use of the files is limited to non-commercial, personal use only! NOTE: You DO NOT need a PayPal account to donate. You can simply click the "Continue" link under the "Don't have a PayPal account?" heading at the bottom of the donate page and use a credit card to donate. If you're dead broke or don't think the source files should cost a thing, that's cool. If you don't want to send money just shoot me an e-mail HERE and you'll get hooked up with the source files. No worries. Scribble On Everything is selling some super-sweet vinyl wall decals of the design. I need to get one of these myself! They are really big (45" wide by 31" high) and they've got color options to choose from. Check it out! 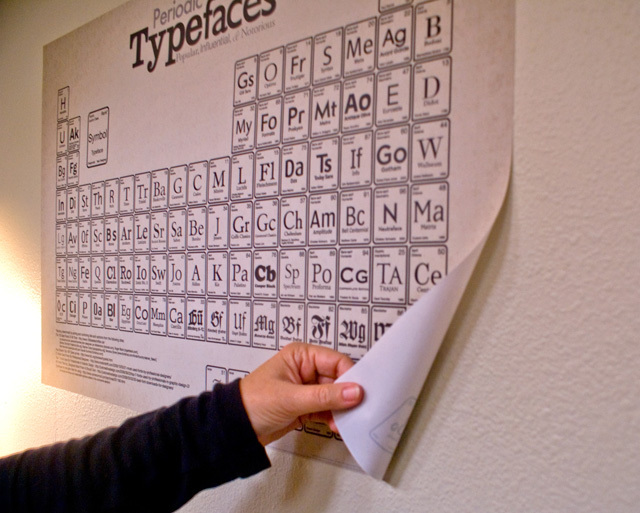 Pi Studio Print has the Periodic Table of Typefaces printed on an amazing sticky-back fabric called Photo Tex which when removed from the wall leaves no residue. It can be peeled off and repositioned hundreds of times. It’s perfect for dorm rooms and class rooms. It sticks to almost all flat surfaces such as glass, metal, and walls. They've got two sizes to choose from: 20"x16" and 30"x20". Check it out! 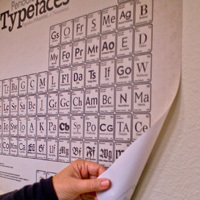 Periodic Table of Typeface Moleskine Cover! 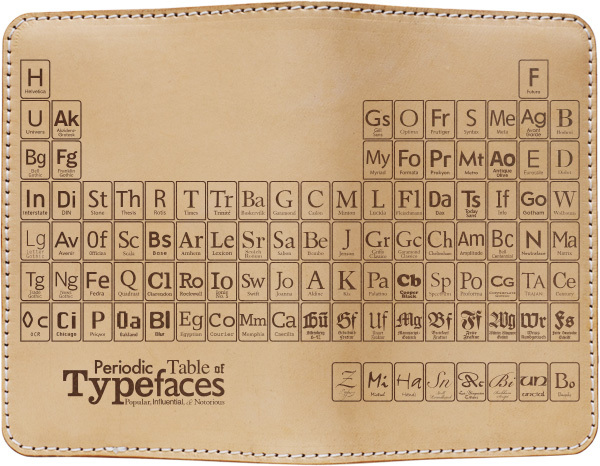 Engrave Your Book has some fine leather moleskine covers featuring the Periodic Table of Typefaces. They also sell the books to wrap this cover around. They have two sizes to choose from and they look fine indeed! They've asked if I was interested in doing individual typefaces for a single cover (much like the shirts) and it looks like we may start with the ubiquitous Helvetica so please check back soon if you're interested. They also will take requests for you favorite typeface once that's off the ground. 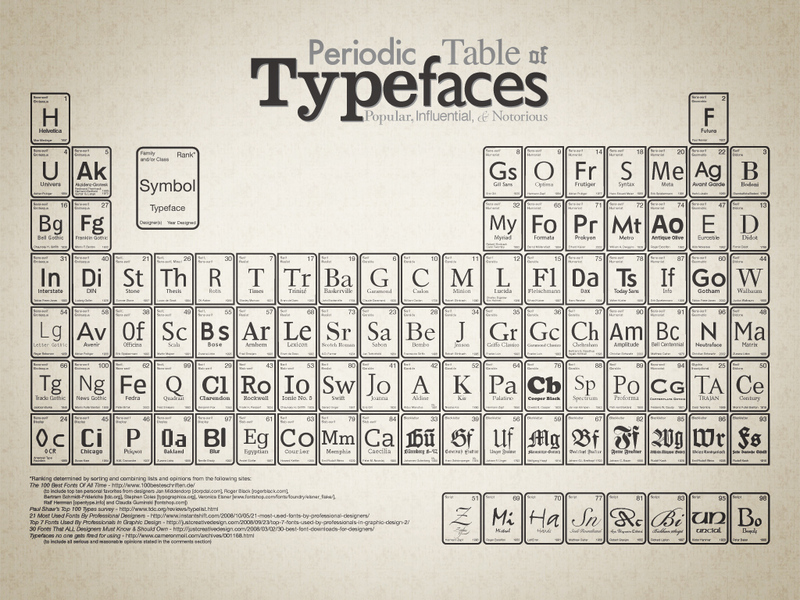 I've seen many comments stating that folks are setting the Periodic Table of Typefaces as their wallpapers. It's a bit too busy for my wallpaper preference but here go! Below are some common wallpaper sizes for you so you don't have to mess around resizing it yourself! 1. I saw this table on [insert blog/website here; i.e. lifehacker, gizmodo, digg, etc)]. Where was it originally posted? 2. 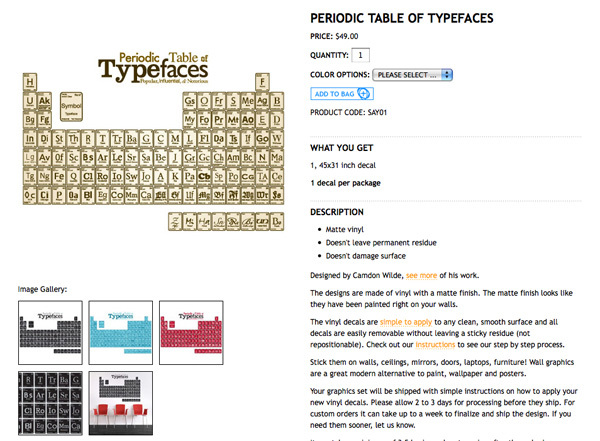 Why doesn't this table match up exactly to Mendeleev's periodic table of the elements? The closer I look at it the more I realize that this isn't periodic at all! What gives, you hack? 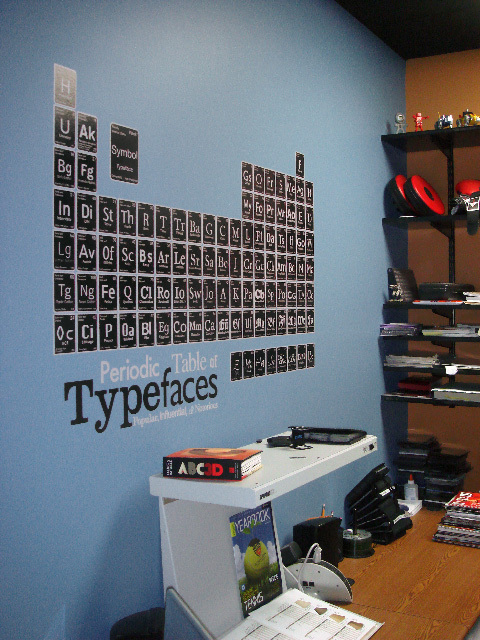 - The intention was never for it to match the periodic table of elements. 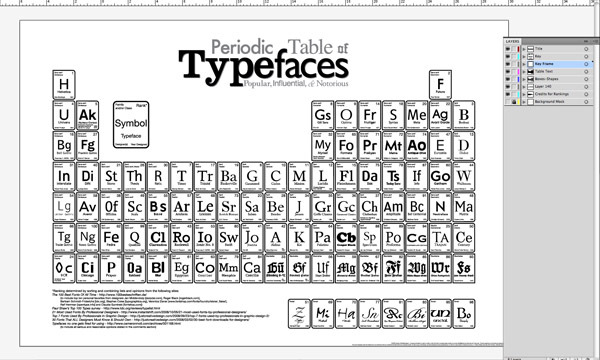 Organizing the Periodic Table of Typefaces to mirror the table of elements would completely alter the current layout. The layout was decided upon simply for familiarity's sake. At a glace, the viewer may think, "Oh look a periodic table." 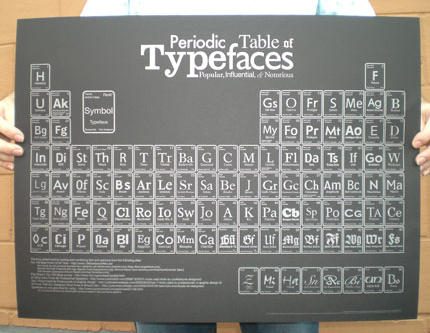 Only upon closer inspection would the viewer realize that the contents are typefaces, not elements. 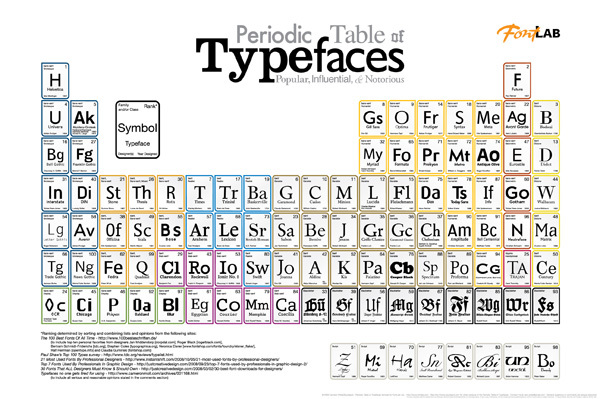 The fact that Helvetica is number one and matches up with Hydrogen's position is purely a nice coincidence. If Gotham was ranked as number one then there would be a big "G" in the upper left cell. 3. 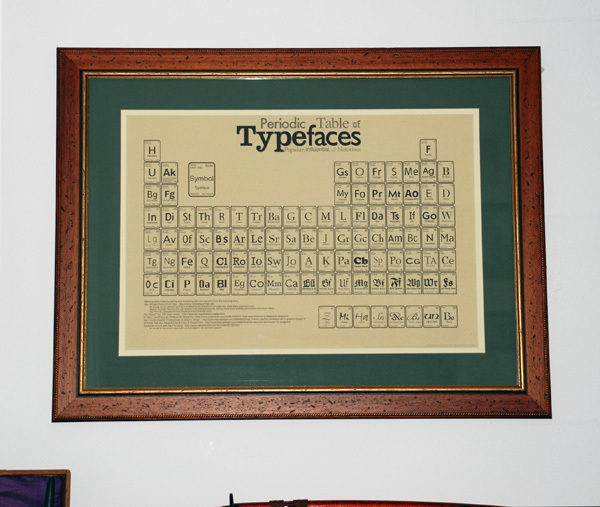 OK, fine, so it doesn't match up with the actual periodic table of elements. What kind of order IS it in? All I see are random numbers throughout. 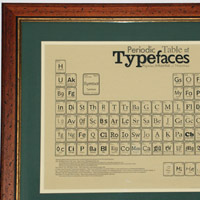 - Again, I wanted to keep this SIMILAR to the periodic table of elements. Once I came up with the ranked list of 1-100 typefaces, I had to decide whether or not to put them in RANK order in the design or family/class groupings. I went for the family/class groups in order to keep similarly styled typefaces together. Look close and you'll see that all the sans-serif grotesques are together; the serif realists are together; etc. The ranks are in order WITHIN each group. 4. How DID you come up with the ranking order? 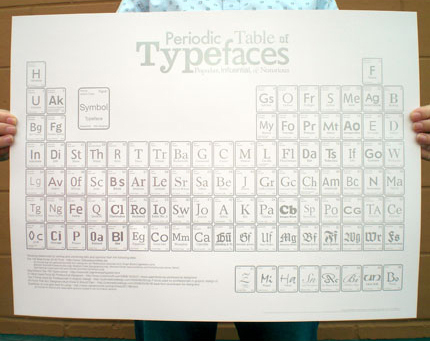 Why isn't [insert typeface here] on the table? 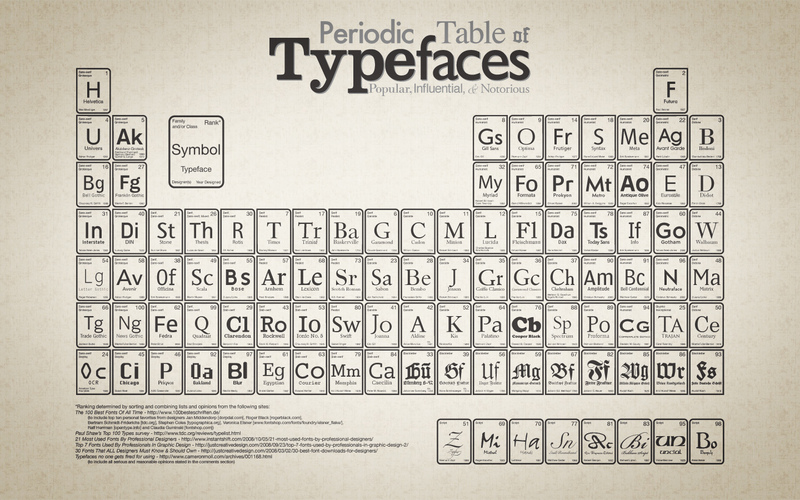 - I didn't decide what typefaces made the list or what rank they received. As stated in the footnotes of the design, I simply took existing, reputable lists that are on-line for everyone to see and combined them to make an "ultimate list." 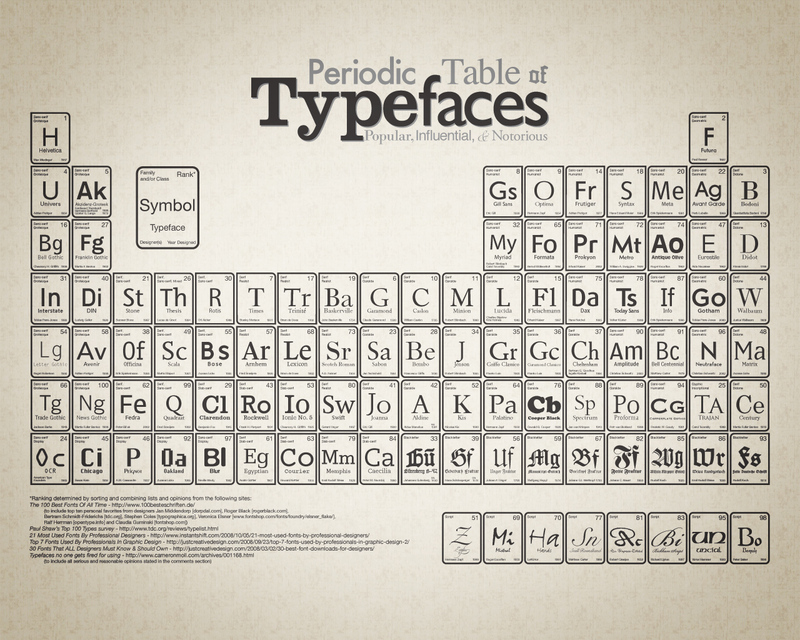 I went through each list, one at a time, and noted each typefaces appearance and rank on the list. Then I went on to the next list and did the same. Ultimately, I averaged each typefaces cumulative scores (to include the number of times it appeared on any of the lists) and sorted all of them based on their averaged score. For example, Helvetica appeared on 7 out of the 13 lists (therefore it's score was 1 for this since it appeared on the most lists). It's rank was 1, 10, 9, 1, 1, 5, and 1. For the lists it didn't appear on it was given a generic score of +1 over the number of typefaces ranked in those lists (the lists Helvetica did not appear in were top 10 lists, so it got scores of 11, 11, 11, 11, 11, 11). I averaged Helvetica's cumulative scores and got 6.785714286. This was the lowest score out of the rest, so it got a rank of #1. I did this for all the typefaces that appeared on any of the source lists. As you can guess, this process was long and very tedious. 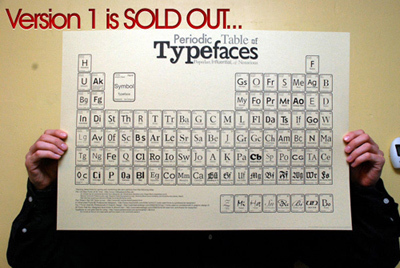 So the short answer is: The Periodic Table of Typefaces rank depended on their appearance on and rank on the source lists and if a typeface wasn't on the source lists at all or scored a cumulative rank higher than 100, then it's not on the table. 5. I saw this table for sale on another site that you don't list on this page! - Please let me know if you do. E-mail me. Got the source files and you're doing something cool with the table? Let me know! I've gotten quite a few requests for the files for some folks to do some really cool things with the design. -Henning Sjögren, a photographer from Sweden, is re-creating the table with 1850's style wet plate photography. Each cell will be it's own glass plate measuring 8x10.5cm and each will hang on the wall by a nail. I can't wait to see some pics of that. -A guy named Jay is having the table etched on the back of his Macbook Pro! -RS Solutions S.A., a photo-lithography company in Geneva, Switzerland is etching the table on plexiglass for display in their building. -The table is in the 5th edition textbook "Visual Communication Images with Messages" at CalTech. 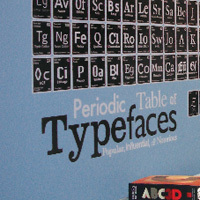 -The table is popping up on office walls and library walls at visual design and printing schools all over the world! © 2007-2009 Squidspot. All Rights Reserved.